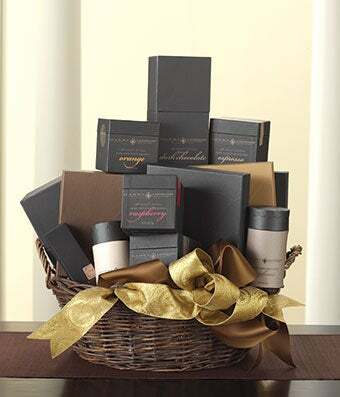 Present someone special with the ultimate assortment of the finest chocolates available. We've hand selected the most decadent delights from the Harry London®, creators of hand-made chocolates for over 80 years. Chocolate espresso squares, assorted gourmet chocolates, milk and dark chocolate truffles, creamy caramels and milk pralines are just of sampling of what this one-of-a-kind gift contains. Expertly arranged in a classic willow basket wrapped with beautiful ribbons, this arrangement measures approximately 23"H x 22"W x 19"D. Contents may vary depending on availability.